I have been extremely fortunate to have seen P!nk (hereafter called Pink so my spellcheck doesn’t have a fit) in concert twice to date. I travelled overseas to Sydney five years ago to see her perform as she didn’t tour here. Then just last week I was one of the fortunate ones who managed to get tickets to her sold out shows in Auckland, where I live. After listening to her albums on repeat and seeing her now twice live in concert, I wouldn’t hesitate to go to another one of her shows. And this makes me wonder: how does Pink create such raving fans that they not only buy her albums, but travel overseas just to watch her live in concert or pay to see her perform more than once? This begs the question about how any artist can create that kind of loyalty and adoration. Of course her incredible voice has something to do with why I became a fan of Pink in the first place, but there is more to it than that. Pink is one of the strongest women I have seen with my life. She walks on wires and flies on trapeze-like contraptions – while singing – at her concert, less than 18 months after her son was born. This takes just a tiny bit of pressure, stress and guilt off of me, and probably many other mamas. She doesn’t want people to judge her as a parent and in doing so is asking us not to judge each other as well. More than anything else, Pink has made it easy for me to be a fan of her as she is who she is and doesn’t change who she shows up for anyone. I know what to expect from her and that is so refreshing. It may only be my theories but the reason Pink has loyal, raving fans is that she shows both her strengths and weaknesses, is open about how hard parenting can be and is always herself. I count myself as one of those true fans, so much so I have not only bought her albums and watched her concerts but now written a blog post about her! Pink – if you read this – I hope you had a great time in Auckland, I hope you had an amazing birthday while you were here and please don’t wait ten years to visit our shores again. 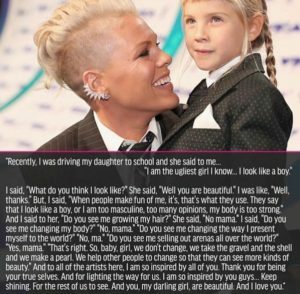 And if that doesn’t inspire you to adore Pink like I do, then look up her 2017 VMA speech about her daughter. Wow. Just wow.